Moldova's national economy is predominantly agricultural and agro-industrial. This two sectors contribute about 60 % of the social product and more than two third of the occupied population are employed by them. The soil is rich of humus and deep and are therefor excellent suitable for agriculture especially the cultivation of wheat, maize, sunflowers and sugar beet. However, there are no bigger deposits of natural resources, so Moldova is forced to specialise in the processing of agro-products and to import industrial products. The Achilles' tendon of the young state is the urgent lack of energy. Coal, gas and oil have to be imported from the Ukraine and Russia. The main part of the foreign trade has being taken place with the FSU. For instance, the former Soviet Republic owns nearly 25 % of all vine cultures in the whole union and played consequently a important role in the vine production. The young Republic Moldova has been in a deep economic crisis since its foundation. In the beginning of the 90's the industrial output, the agricultural production and the national income decreased dramatically. The GDP amounted in 1994 to 3.672 Mio. USD. Since 1980 to this time the whole economic output grew only by 1,3 %. Especially since the beginning of the reform process the negative development has accelerated. Only in the year 1994 the GDP decreased by nearly a third. Similar to other reform countries the restructuring process in Moldova entails painful economic losses. Today, roughly 50 % of the population live in poverty. The average nominal wage of February'97 of 183 Lei (approx. 40 U$) per month covers only 40 % of the Minimal Consumer Budget. Especially the high inflation made the situation worse. Fortunately, the rate declined form about 60 % per month (1/94) to about 11 % per year (96). The privatisation of state property is surely one of the most important changes, which the reorganisation form command economy to market economy entails. The private possession of capital goods as well as the connected retreat of the state are prerequisites for a functioning market. Whereas the latest privatisation wave in Western Europe mainly aims to redevelop the budgets to meet the convention-criteria, the selling of state property in Eastern Europe is the laying of the foundation stone for the privet sector. Due to the lack of competition, the lack of business knowledge and the priority of satisfaction of needs state enterprises were quite unprofitable. But being very strict, co-operative property in the literal meaning didn't even exist in the FSU. Kolkhoz (collective farms) were fully managed by state bodies, which, in turn, were instruments of the communist political structure. This co-operatives have never enjoyed true economic or productive independence. Already 1987, at a time when private property was a foreign word of the capitalist west, some hidden forms of privatisation appeared in the USSR Law "On Co-operation". Workers in newly founded enterprises became co-operative members, and in some cases they themselves were registered as state co-operatives. By 1991 about 5.000 independent and state owned co-operatives were registered in the Republic. By March of the same year, 211 businesses with mixed capital structure were recorded. But only 50 % of them started to work. All in all they contributed 1.1 % of the 1992 GDP. In 1990 the parliament initiated a program of economic reforms by adopting an initial package of legislation on private property, including the Land Code, business activities, banking, taxation and local self-administration. This first phase of economic transition was aimed to guarantee macroeconomic stability, to start land reforms and mass privatisation of enterprises. Quite similar to the privatisation process in Romania, Moldova pursued the transfer of state property on three fronts: Firstly, the Mass Privatisation Program (MPP), secondly the management/employee buy-out and last but not least the selling to strategic investors. In 1991 the Parliament of Moldova laid the foundation stone for the privatisation process by adopting the law "On Privatisation". Unfortunately, it failed to set up certain rules and regulations for the immediate start of the process the founded State Department for Privatisation was undermining the process. The submitted State Privatisation Program 1992 was rejected by all instances (Highest Economic Council, Security Council, Parliament). Nevertheless, the Government started with a stocktaking and evaluation of all state properties. By the end of the year all state owned enterprises and institutions were recorded (with exemption of Transnistria, where the administration didn't permit it). The basic rules of the privatisation in Moldova are embodied in the Privatisation Act, which passed the parliament 1991. The included National Patrimonial Bonds should guarantee equal rights for all citizens concerning their claims to state property. The Government started in September 1992 with the formulation of lists including citizens, who should receive these bonds. By February 1993 the work was completed. These bonds made it possible for each citizen to get his part of the state property. The par of these registered securities depend on the length of service of the citizen to whom it was issued. Through the issue of the NPBs the government tried to enable a reliable protection of the economic interests of the Moldovan citizens during the privatisation process. A equity among the Moldovans in receiving their share of State property and certain respect for the employees opinions were also a concern. As a matter of principle they can't be purchased by foreigners; only through a permission by the Ministry of Privatisation special exceptions are possible (Law "On Privatisation", Article 12). All these measures took much more time than considered, so that the privatisation process started with delay. Moldova's privatisation process is organised in two-year-term programs. They define the further steps for the next two years, set main emphasises and take stock of the previous program. 40 - 50 % of the state assets. The majority (1595) had to be privatised free of charge through NPBs, 37 enterprises for national currency and the rest for hard foreign currencies. Some state corporations were designated to remain in state ownership including utilities, scientific institutes and large-scale food processing companies. The privatisation process was divided into two stages. The first stage ("social stage") was used to sell one third of the state property in exchange for NPBs. This enterprises included the agro-industry, industry, transportation, road construction and maintenance, pharmaceutical and trade entities. As the bonds are only available for Moldovans, this stage was closed for foreign investments. The second one ("cash stage") was to privatise another third against cash. The sale was carried out by two different forms of auctions. The public "open outcry" auctions were mainly used to sell small enterprises such as, for example, restaurants, cafeterias, shops and public services centres. The sale of medium and large sized enterprises was carried out through the second form, the national "Subscription for Shares" auction. The enterprises scheduled for privatisation were subdivided into four categories. Namely, enterprises which were entirely privatised using NPBs (e.g. agro industry, industry, transportation, road construction), for cash (hotels and gas-stations etc. ), unfinished constructions and buildings sold for cash and enterprises, which have to be partially privatised with NPBs or cash. 115 so-called collection centres were established throughout Moldova to collect bids. The central part of this network (based on the Czech model) played a computer centre that processed the results of the auctions. To create an incentive for employees to invest into and to become owner of their corporations, they were entitled to get up to 20 % of the value of the company at preferential prices. Managers did not have any additional advantages. The so-called "Golden-Share", which would continue the state's control and say was not introduced. Suppliers of agricultural raw materials received 50 % of shares free of charge in order to retain technological links. At this early stage of the privatisation process progress was initially very slow. The majority of sales was carried out after the election in 1994. To be highlighted is that during the first quarter of 1993 about 6,400 non-state enterprises were registered in the Republic. But according to data from the Ministry of Justice's Chamber of Registration, already by the middle of 1993, there were 10,925 limited companies, most of which were functioning with private capital. Limited companies are economic units established through the introduction of capital, by an individual person, into a statutory fund. Only a relatively small number of the functioning limited companies (approximately three to four percent) were co-established with the participation of state enterprise capital. The same source states that by the middle of 1993, there were 600 JSCs registered in Moldova, 143 of which formerly were state enterprises, including "Moldovahidromas", "Bukuria" and "Steaua", some of the largest enterprises in country. The JSC establishment process, reviewed by sector, reveals the following: in industry, 24 state enterprises were converted into JSCs; in the service sector, 41 were converted; in the construction sector, 11 were converted; and in the commercial sector, ten were converted. JSCs currently functioning in Moldova can be classified as follows: In 1992 and 1993, around 900 million roubles from these sources were invested in production by workers of state enterprises, and 40 million roubles were transferred to the state on July 1, 1993 as a dividend. JSCs are a welcome form of private and state capital association, as sources for investments are gained, without dependence upon commercial banks, in which interest rates exceed 170 percent. Additionally, financial resources of the workers are, to a great extent, guaranteed by revaluation of the assets, and personal savings are used not for consumption, but for investment. Undoubtedly, JSCs are more highly prepared for privatisation than those organisations that remain unchanged. 1994 the official figures show the Gross Domestic Product (GDP) of Moldova, including an estimate for Transnistria, to be falling by 31%, following declines of 1.2% (1993), and 29% (1992). 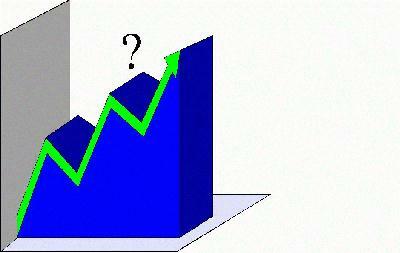 The consumer price index (CPI) in April 1993, in comparison to March 1993, constituted an increase of 119.9%. In 1993, two additional negative factors emerged. First were the trade barriers imposed by Russia, which resulted in the interruption of trading, discounts; the introduction of a double excise tax, import tariffs, and the added-value tax; and the unexpected withdrawal from circulation of ex-Soviet banknotes (roubles). Second were the natural calamities - pouring rains with hail - that caused damages of 20 billion roubles. Since January 1, 1993, the National Bank, under the influence of 500 percent inflation, increased its discount tax and fixed it at 175 percent, with the option to fix interest rates of commercial banks at 180 percent. According to data from the State Department of Statistics, for the first half of 1993, inflation equalled 369 percent, an amount considerably exceeding discount tax growth. Private enterprises and enterprises with mixed capital (only partly privatised) have already played an decisive part in the production. As Graph 1 figures the private sector produced at this time more than 49 % of the industrial, 86 % of the agricultural production and 47,8 % of the retail trade. These non-state enterprises attracted more than 33 % of the total investments. On January 1, 1995 out of 61.400 economic entities more than 57.000 were privately owned, the rest remained in state property. The privatised co-operation include 1.500 JSC (public as well as private companies), 15.100 companies limited by shares and 21.400 single-owner companies. The mass privatisation program was completed until the end of 1995, when the last of 1.137 large or medium enterprises and 613 shops were privatised. With reference to data of the Ministry of Privatisation and State Property Administration more than 3.1 million people- about 90 % of the Moldovan citizen - used their NPBs in order to invest in shares of companies or to privatise their apartments. However, the individual shareholders are a little minority. Only 20 % of the total subscribed shares were bought by them, the rest has been sold to fiduciary companies or investment funds, which play even in small scale businesses an important role. More than two-thirds of the Republic's non-agricultural economy has been transferred into the private sector, what has been described as the most far-reaching, fastest and fairest privatisation initiative of the Former Soviet Union (FSU). The following program was adopted by the parliament on March 1995. It envisaged the partial completion of the 1993-1994 Program and was designed to transfer around 800 mostly medium-sized companies into the private sector, which cover about over third of the initial state assets in the economic sector. A far-reaching change was the permission for foreigners to have a majority stake in concessions and joint-ventures. Special attention was paid to sectors of significant importance for Moldova such as the agro-processing, utilities and telecommunications. During 1995, approx. 1.600 companies have been sold, the total revenues amounted about MD Lei 2.880 million (some USD 640 million). 200 enterprises were scheduled to be privatised for cash, proceeds of about MDL 140 million were expected. But by the end of the year only 44 companies were privatised, the revenues relatively humble MDL 22 million. The tobacco tender, which was the first of these sales has been won by the German company Reemtsma, which is going invest about USD 10 Mio (largest investment-project in Moldova). To speed up the privatisation and to attract more foreign capital, in the course of the Second Privatisation Program a number of service agencies were set up in co-operation with international organisations e.g. the World Bank. This agencies have western business knowledge and provide it to the entrepreneurs. One of most important of them is the Agency for Restructuring Enterprises Assistance (ARIA). It was set up by the Republic Moldova, the World Bank, the European Union and the German Aid Program and provides business advisory services for privatised companies. Main problem of the restructuring program is the enterprises high level of debt at the state , the social fund, the utilities and the commercial banks. The restructuring plan is worked out in each case by the owners and the management on the one hand, and the major creditors on the other hand. Economic advice is provided by local and foreign consultants. Through freezing, rescheduling, conversion of debts from short to long term and reduction in interest rates a moratorium on historic debts could be agreed for 6 - 9 months. Precondition is the signing an agreement on debt restructuring with the State Creditors Council, which has to accept the restructuring plan. The loan as such remains. Other features of the Restructuring Program include the laying-off of half of the employees, even if the percentage varied greatly among the different enterprises. To relieve the social impacts of this hard measure compensations have to be worked out. Unfortunately, the effectiveness of them couldn't be found out. A lot of large enterprises have to be down sized in order to achieve more flexibility and to reduce costs. In all instances the new entrepreneurs are assisted with business plans but the investigations are undertaken by themselves. Further features of the Restructuring Plan are the sales of unwanted stocks and finished goods and in certain cases the disposal of unwanted asset. This measures result so far in an improvement in production flows, the elimination of barter, which played a non-neglecting role, overall gains in efficiency and the collection of around MDL 7 million of outstanding debts. By the end of 1996 about 990 companies with foreign capital were registered. They are mainly engaged in trade followed by industry, commercial banking and real estate business. In 325 cases the foreign investor owns 100 % of the capital. Numerical, the most investors come from Romania, Russia, Germany, Bulgaria, Syrian, Italy, Turkey, Ukraine, U.S.A, Israel and Great Britain. The current program has been adopted by the Moldovan Parliament at the second reading. During its debate period the old Minister of Privatisation and State Property Administration, Ceslav Ciobanu, was replaced by Iuie Badir. The successor guaranteed the continuity of the privatisation process, so that there are no decisive changes in the Moldovan policy expected. The program envisages the accomplishment of the public property privatisation and the reforming of the national agrarian sector. The selling of property is mainly for cash. The program defines corporations to be privatised, enterprises subject to privatisation against individual projects to be approved by parliament and unfinished construction objects to be privatised. A peculiarity is the permission to attract local and foreign companies experienced in complex-like projects of privatisation and restructuring of such enterprises which may attract strategic investors. The MPs cancelled a point which would have grant privileges to the employees of the privatised corporations such as payments at grace, discounts to price etc. In the beginning it was also considered to insert a provision making the utilisation of a part of the privatisation receipts for a financial support of the privatised enterprises possible in case of submitting a restructuring program. But also this point was voted down. The lease of enterprises which are subject to privatisation is prohibited. This third program is open for Moldovans, domestic legal entities excluding state-owned enterprises, foreign legal individuals and legal entities and stateless persons. A number of large enterprises have been crossed out from the list of objects to be privatised, namely the Chirsova Winery, Seabeco-Moldova, and Vibropribor JSC (a leading electronic factory). Moreover, a commission has been set up in order to examine the legitimacy of the establishment of the latter, as a group of investors came illegally into the possession of a controlling part of shares. The privatisation of land was a tedious and difficult project. Already in 1990 the implementation of the reforms were postponed for two years, even it would have been planned in the Land Code and supported by international organisations as the World Bank. According to the current Moldovan legislation the privatisation of land used for agricultural production has to be carried out by two measures, which have to be put simultaneously into effect. The first step is the change of tenure from use right to ownership. In contrast with the transfer of public property, this transfer of collective property has to be free of charge. The kolkhozes become property of the farmers. A peculiarity is the fact that claims of former owners, who (or their ancestors) have been dispossessed are disregarded. The second step covers the transformation of the farms into JCS, or their division into private property for all members of the unit. Experience has shown that this two steps have to be implemented together. A first attempt failed as the parallel reorganisation into JCS wasn't carried out. The new owner were confronted with the power of the kolkhoz leadership. The former heads of the farms continued to possess all the common property and to operate according Stalinist kolkhoz principles. But this is not the only problem. Others arose concerning the distribution of the shares. How to deal with pensioners, employees and former workers, who also claim a part of the shares? Media report of numerous conflicts between local self-administrative bodies, which are responsible to distribute the land among the farmers, the kolkhoz administration, which currently owns the farm and the Ministry of Agriculture and Foodstuffs. All these obstacles aren't totally solved up to day and lead to a very little progress in privatising agricultural land. The situation differs from that one of the privatisation of non-agricultural land. As already stated in the beginning (see above The 1993-1994 Program), the majority has been transferred into private ownership through NPBs. According to the Law on the State Privatisation Program 1995-1996 foreigners can take part in the selling of adjacent land of enterprises already privatised or to be privatised, and of land pertaining to family garden plots. Build-up land can be traded freely and also be purchased by foreigners. Nevertheless, the current Land Code doesn't permit the free selling and buying of land. Apart from the exemptions stated, it will take until the year 2001 to trade with it. Also the implementation of the privatisation of public living space has to struggle with starting problems. The first law concerning this matter was adopted by the deputies with out the right appendixes (different regulations, lists of enterprises etc.). So, anti-reformist succeeded in delaying the process. The final version of the law "On living space privatisation" includes the transfer of living space on a free of charge as well as on a cost basis. Criterion for that is the length of service of the husband and the wife, on the territory of Moldova. Cost-free privatisation refers to a housing-area of 20 square meters per family member plus 10 square meter for the family. A couple with a combined length of service of at least 35 years, get their apartment for free. Those, who worked for 30 to 35 years must pay 25 % of their apartment costs. Their price depends on a governmental index. Pairs, who worked between 25 and 30 years in total must pay 50 %, those who did less must pay the full price of their residence. The length of service is for single people the half. But not all buildings are objects of the privatisation: monuments of architecture, history and culture, those in need of repair and those that do not correspond to the living standard etc. Currently, there are five Living Space Commissions in Chisinau, one for each district of the country. Surprisingly, there's only one permanent full-time employee in each, the secretary. So it is not no wonder that the commission's operational capability is extremely low. A market is now developing in housing with considerably higher prices in the centres such as Chisinau and Balti. As there were very little housing built in the last years, a prosper housing market could be a stimulus for the whole economy. Prerequisite therefor is the wider introduction of housing loans or rather of financial institutions such as mutual funds, which do not exit at present. The extreme material burdens and a certain disorientation which come along with the economic reforms have led to calls for the good old times. This is not rather surprising, as up to now the situation for the man on the street has become worse than better. A lot of developments doesn't coincide with the former-communist ideal. Unemployment is rising and the government wasn't able for a long time to pay wages and pensions to the civil servants. The growing income gape, increasing prices and poverty are pinned on the reform process, commercial activities and the privatisation. However, Moldova has been spared from drastic impacts due to the low speed of reorganisation compared with other FSU-countries. Despite all this, the train of privatisation cannot be stopped. Enterprises with foreign     380           204          453          n.a.